Recently, we met Adrianne Nascimento, Founder of Nurish Organics, over the Toronto International Film Festival weekend. We were very lucky to receive a package from Nurish Organics to try. Both Telly and myself received a day and night cream, See Spot Run (Erases Blemishes for the day) and Hello Beautiful (To work wonders on your skin at night). Funny how skin works because Telly broke out when she used the product and developed a rash on her face. To make sure it was the use of a new product, she stopped using the cream and the rash went away. Telly does have very sensitive skin. On the other hand, I used the cream and it worked great! You only need a little bit on the finger tips to rub on your face & neck and it leaves the skin matte and soft, not greasy. 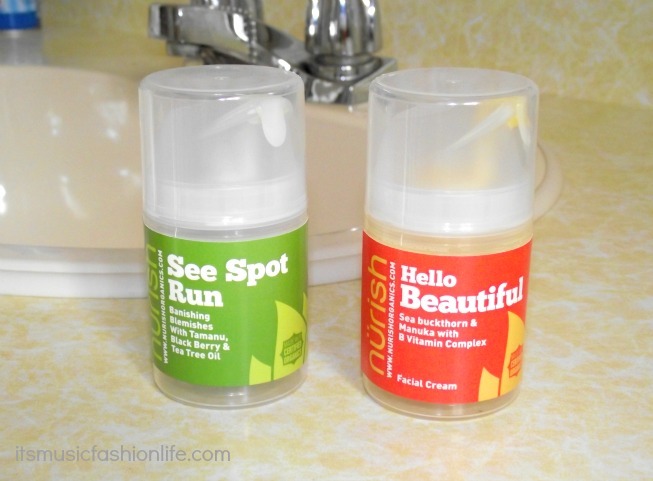 One thing we both loved about these products was the sweet smell! Great way to start the morning and end the night.